Maybe you read the comment from this woman who survived the September flooding of tiny Hammond in southeastern Minnesota. Tina and her family fled their flooded home and lived in a hotel, then a rental house in Rochester, before returning to Hammond shortly after Christmas. In case you missed Tina’s heartfelt comment, I am republishing it here because you need to read the words of this flood survivor. She writes with touching honesty, depth and emotion. 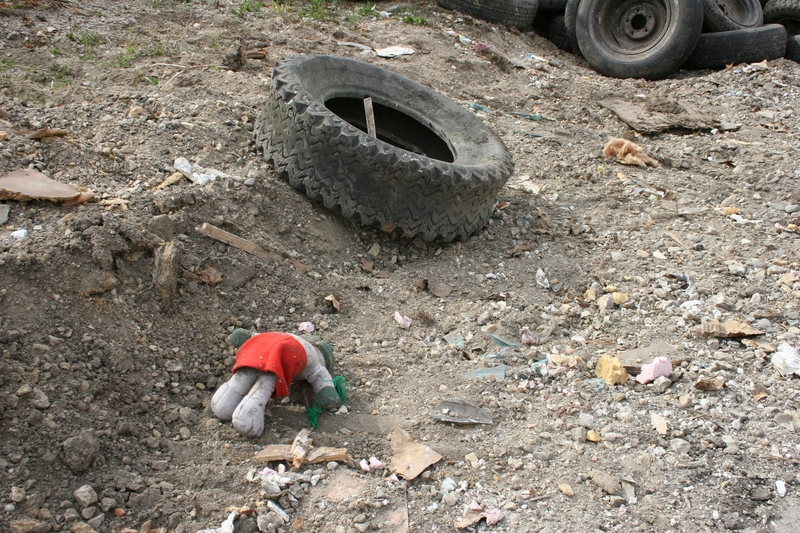 A child's toy lies among the tires and other rubble at a collection point in Hammond when I visited the small Wabasha County town along the Zumbro River some 2 1/2 weeks after the September flood. Seeing that child's discarded toy among all the flood debris depicted, for me, the personal side of this natural disaster. You’ll hear more from Tina in the future. She sent me a four-page e-mail in response to additional questions I asked. Her answers will move you to tears. Once I’ve sorted through her missive—and that could take a week or three—I’ll publish Tina’s complete story in a series of installments. I AM THE DEAR FRIEND that Katie spoke of. My name is Tina. I am happy to report that my family: my father and mother-in-laws to be; my fiancé, Micheal; and my children, Cassandra and Christian, moved back into our home in Hammond the weekend of New Year’s Eve. We tried desperately to get back in by Christmas, but a couple of our snow storms and other glitches set us back a few days. But we are home, finally. It has been a long, hard road to get here, and it is simply amazing how far we have come in such a relatively short amount of time. We are lucky, so very, very lucky. We are the third or so family home so far. But it is comforting to look out the window and see the contractors in our neighbors’ houses! I know now what they don’t quite realize yet. Their homes are going to be beautiful once again, and most likely better than they were before! I cannot even describe the emotions of coming home to a beautifully rebuilt home, after all we have been through. It would have never been possible, though, without the hard work, generosity, and compassion of all of our neighbors. Not just our neighbors in Hammond, Zumbro Falls, Mazeppa, Millville, Elgin, Plainview and Rochester, but also our neighbors in Rushford and Winona area who know all too well the nightmare we are going through, our neighbors from Minneapolis, Wisconsin, Iowa, and reaches farther than anyone will ever know. It has all been a truly amazing demonstration of humanity…. indescribable. I am very proud to live in such a wonderful place, and eternally grateful to each and every person who has already, and those who are still to come, for all of your help. There is still a lot, I mean a lot, of work left to be done, and I know that with such wonderful people surrounding us that it will be done. What a wonderful note. Its so very positive. It could have easily been bitter and sad. Good for Tina for finding the good in things as the clean up continues. We can all take a lesson from Tina and her positive attitude.